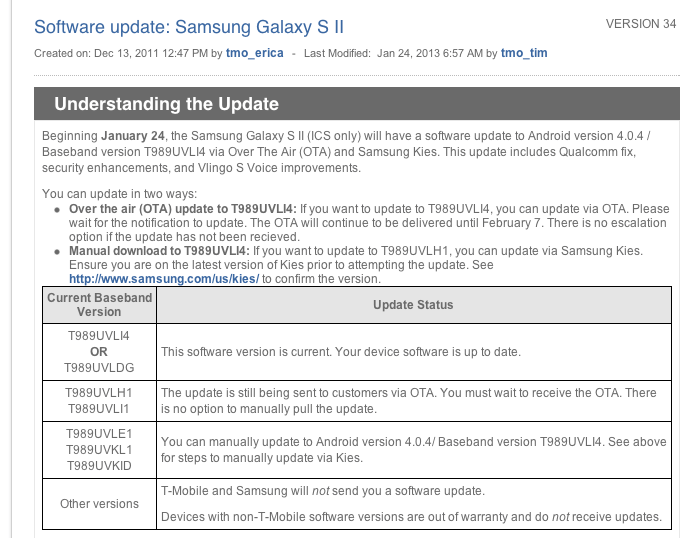 Galaxy S II owners should on the lookout today for a new software update rolling out Over The Air (OTA). This update, which began this morning includes a Qualcomm fix, security enhancements, and Vlingo S Voice improvements. The new update will move to Android version 4.0.4/Baseband version T989UVLI4. Over the air (OTA) update to T989UVLI4: If you want to update to T989UVLI4, you can update via OTA. Please wait for the notification to update. The OTA will continue to be delivered until February 7. There is no escalation option if the update has not been received. Manual download to T989UVLI4: If you want to update to T989UVLH1, you can update via Samsung Kies. Ensure you are on the latest version of Kies prior to attempting the update. See http://www.samsung.com/us/kies/ to confirm the version. Ugh why cant we get JB!!! Samsung just stated the roll-out for the JB update for the International Version of the GSII. We should be able to see this update coming on the next weeks to a month if the update schedule will be similar to that of the GS3 JB update. Ha yeah now you know we have all heard this similar story before!! He’s not lying the International s2 barely got jb it’ll be a long while til tmobile rolls it out I remember when I had my s2 the wait for ics was horrible. Now I have the note 2 so no more waiting. The note2 will be just the same. It’s a branded and subsidized variant for tmobile. You’ll likely get the next OS update but after that you’ll be waiting quite a while to get newer versions of Android just like everyone else, unless you have an international GSM note2. The only devices that are guaranteed updates is Nexus products. Sure, the note2 comes preloaded with JB but that’s it. Doesn’t mean it’ll be first in line to receive the next version. so where’s the one s jb update? If it won’t stop the freezing, then it doesn’t matter. However, i am still proud at the support Samsung is giving its older devices that are hardware capable. Just got the update. It’s horrible. Everything is erroring out. Google play Store doesn’t work. Phone is locking up constantly. I wouldn’t update your phone if you want it to work. Try wiping the cache partition. ahhh. Thank you for your help. The Cache Partition wipe didn’t work but I appreciate the help. What you actually have to do if Google Play doesn’t work, is got to Settings>Applications and then go to Google Store and uninstall it. Then reset your phone and click on the Google Play store. it will then download the correct version for your new version of Android. Came here to see if there was news about update and what it fixed before proceeding. So far so good. Took about 5 minutes and so far things are okay here on stock Android ICS. Maybe it will fix the occasional problems I was having trying to call out or get calls. But yet Samsung makes great phones. I complain about my s3. Everyone says I am wrong. You seem angry. Don’t worry, I’m sure that Apple fanboys are much more willing to admit that Apple’s products have flaws. Is there anyway NOT to update this? Is this a 4.04b? We already have a 4.04 and I am not having any issues with it. Updated. Seems to be working fine but I lost my root privileges. SuperSU is still listed but when I tap it I get, “There is no SU binary installed, and SuperSU cannot install it. This is a problem!” What do? I never upgrade my GS2. Once I findout that by up grading the OS,flash would no longer work. I said thank you no. I know you can side load it. but what point? Some people believe the reason flash gave up on android was because they are afraid of Apple suing them. Not sure if that’s true or not. I will keep my stock GS2. At the end of the day,it is only a phone. I used KIES to get the latest update for my galaxy s2 only to end up with a bricked phone. During the process of updating the phone Kies experienced an error and did not complete the installation of the update. Efforts to do an emergency recovery were hopeless as the phone was frozen. Computer would not recognize the phone thus could not do emergency recovery. Hard restart could not overcome the fact that the phone was frozen (bricked). Samsung tech support tried as they would but nothing in their bag of tricks could un-brick the phone short of sending it to Samsung To have the OS re flaMikeshed. Fortunately for me, the phone was within the Samsung warranty period and Samsung will be sending out a replacement. Samsung/T-mobile just release Jelly Bean for the Galaxy S2! Screw the minor releases. Mike posted a similar story to my, but I just want to check out, if this is more common problem. I tried to upgrade my Galaxy S2 firmware via Kies last night. The whole process went through as directed by Kies. After I was asked to disconnecting the phone as asked the only thing which happened was status bar on the top and black screen. A message on the screen said “Application installer failed” and the phone has been bricked. Tmobile tried to walk me through factory reset. That did not help and neither trying to connect back to my pc via Kies. Prior to the factory reset, I could at least receive a phone call. As I was told by Tmobile it is out of warranty I was offered to buy a new phone or try to contact Samsung directly. I am on a value plan and still paying for the phone. The tech guy gave me Samsung phone number and they were more helpful. The phone is apparently still under warranty (despite Tmobile claiming the opposite) and I just shipped it to the repair center. I hope there will not be an additional issue on Samsung side . I like tmobile, but if you are upgrading the firmware, make sure you are still under warranty to save you a headache. How many people had an issue with the black screen after the upgrade? Frank, I suspect there is a glitch in the KIES software that is causing the phone to become bricked. I’m clearly not going to risk any future updates. Samsung should re-examine the Kies software and make sure that it’s safe to use. Some may not be so lucky to be covered under a warranty and have to pay to get the phone repaired/replaced. I’d also be interested to know others experience with this update. Frank, call Samsung and see what help they can offer. When I tried to do the update on Kies it bricked my phone. Samsung can reload the software on the phone. My phone was in warrant so it didn’t cost me anything. The cost of the repair might be cheaper than a new phone. Good luck.